This plugin for the Eclipse IDE helps making IPK packages for Personal Java programs and Qtopia PDAs, for example the Sharp Zaurus. The plugin was developed as an exercise about the Eclipse plugin interface and the SWT library. Later we decided to make this plugin available under the terms of the GPL to the general public. If you have some suggestions or questions about the plugin you can use the contact form to write us. But please understand, that we can not answer all questions, because this plugin is only an exercise project. The plugin is licensed under the terms of the GPL. You can read the GPL here. With your download you accept the GPL for the IPK plugin. 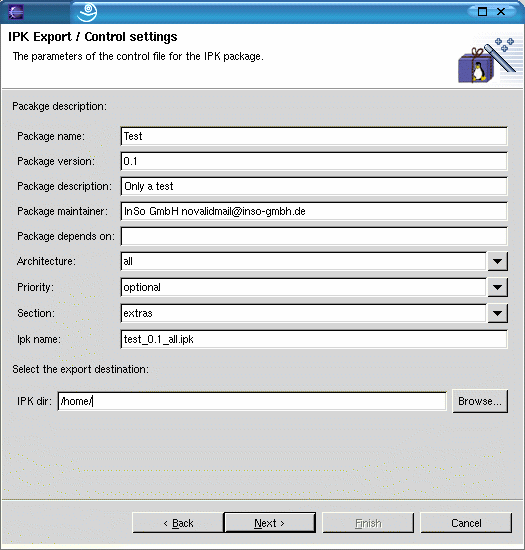 IPK export plugin version 0.1 including. source code for Eclipse 2.1. Tested with Eclipse 2.1 on Windows and Linux. 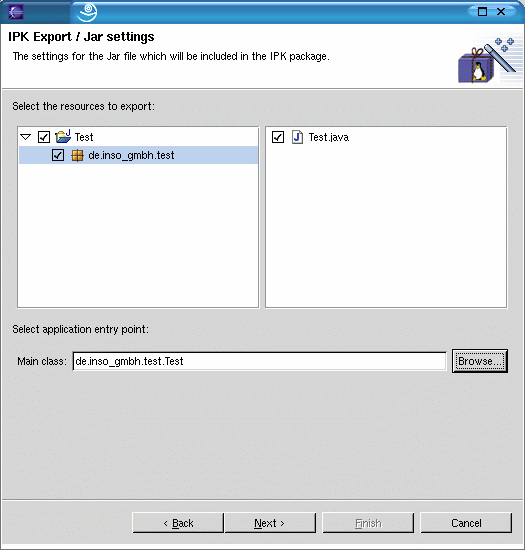 IPK export plugin version 0.2 for Eclipse 3.1. Tested with Eclipse 3.1 on Windows and Linux. The plugin don't work with Eclipse 3. IPK export plugin source code version 0.2 for Eclipse 3.1. First public release for Eclipse 2.1. Dialog settings now are saved and restored. The settings are saved in the project resources / file IPK_CONTROL.xml. Unzip the zip archive in the directory where your Eclipse directory is located. After unzipping you should find the plugin in the eclipse/plugins/de.inso-gmph.ipkplugin directory. After you restart eclipse, you should find the plugin export wizard in the export menu. Below is a short manual for the IPK plugin. The screenshots are made under Linux/GTK. With this dialog page the Java class files and other resources can be chosen for export. The wizard generates a jar file with this content. This jar file is a part of the IPK package. Choose resources: Choose the java classes and other resources to export. Select main class: Select the java class with the static main method which should be called on program start. 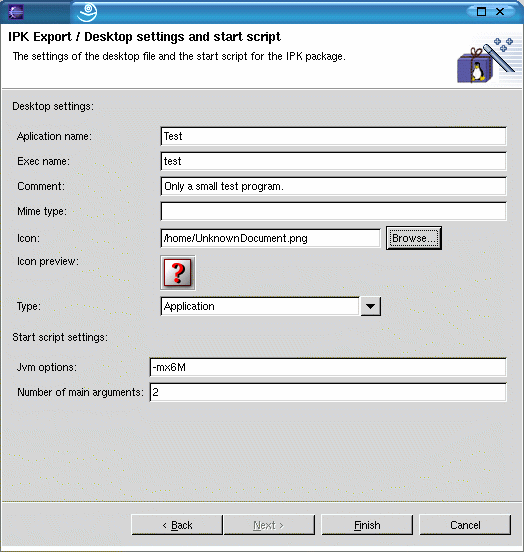 With this dialog page the settings of the IPK package control file are made. Name: Name of the package. This is the name which is used by IPK installer applications. This parameter is the value of the "Package" entry in the control file. Version: Package / program version. This parameter is the value of the "Version" entry in the control file. Description: A short description of the package content. This parameter is the value of the "Description" entry in the control file. Maintainer: Name and email address of the package maintainer. This parameter is the value of the "Maintainer" entry in the control file. Package dependencies: Other packages which are needed by this package. If it depends on more than one package, the several package names must be seperated by a comma. This parameter is the value of the "Depends" entry in the control file. Architecture: Device / processor architecture on which this package can be used. Personal Java programs should normally use "all". This parameter is the value of the "Architecture" entry in the control file. Priority: The most programs should use "optional" here. This parameter is the value of the "Priortiy" entry in the control file. Section: The category which fits best for this package. This parameter is the value of the "Section" entry in the control file. IPK name: The filename of the IPK package which should be created. This field is read only. The name is automaticly generated as follows: < Name> _< Version> _< Architecture> .ipk. IPK directory: Directory for saving the IPK package. This dialog page contains the settings for the desktop file and the start script. These parameters set, for example, the place where the package is installed on the PDA and which icon is used to start the application. Application name: Name of the application. This is the name which is shown by the PDA program manager. This parameter is the value of the "Name" entry in the desktop file. Executable name: This is the name of the executable program. This field is automatically generated and read only. The executable name is equal to the application name, but it contains only lower case characters. This name is also the name of the script which starts the Personal Java program. This parameter is the value of the "Exec" entry in the desktop file. Description: Short description of the program. This parameter is the value of the "Comment" entry in the desktop file. Icon: The optional PNG file with the programs icon. A preview of the icon is showed under its name. This file is also included in the IPK package. In the package it is renamed as follows < Application name> .png. This name is also the value of the "Icon" entry in the desktop file. Program type: Type of the program. This type defines also on which start page the program is inserted by the PDA program manager. This parameter is the value of the "Type" entry in the desktop file. JVM options: Additional options which should be given to the JVM (EVM) on program start. This field can be empty. Number of main arguments: The maximum number of arguments which should be given to the Java main method by the start script. For no parameters set this field to 0 or leave it empty.